In the last few years, the demand for website speed and accessibility has grown drastically and user’s attention span has shortened significantly. 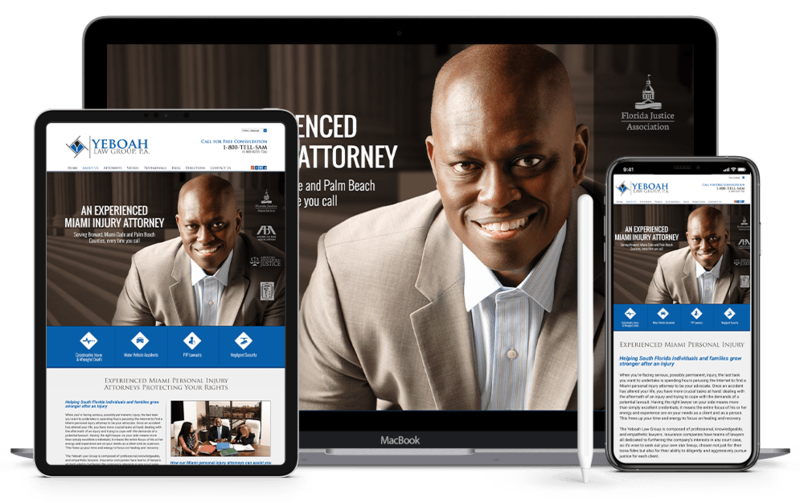 You have just a few seconds to capture the attention of a potential client and your law firm’s website needs to be accessible from a desktop, laptop, smart phone or tablet. If you don’t appear distinguished, accessible and easy to contact, that potential lead is likely to use their back button and look to your competition instead. Digital Law Marketing, Inc. website designs put the features your potential customer is looking for front and center to make conversion easier for them. At Digital Law Marketing, Inc., our designers focus on combining artistic talent and scientific data to create your law firm’s website into a conversion machine. Your website should match your offline branding and we work closely with other marketing companies to make sure that your branding is consistent to help your marketing materials deliver maximum performance. Most importantly, we want you to showcase your website proudly and feel that it represents your practice. Our designers will walk you through your design every step of the way and make sure that you are proud of it before anything goes live. Our website designs normally take 30-60 days, depending on how many revisions are necessary, but if you love the designs we present, it is often even faster. If you are in need of a new website design for your law firm, call Digital Law Marketing, Inc. today and fall back in love with your website.